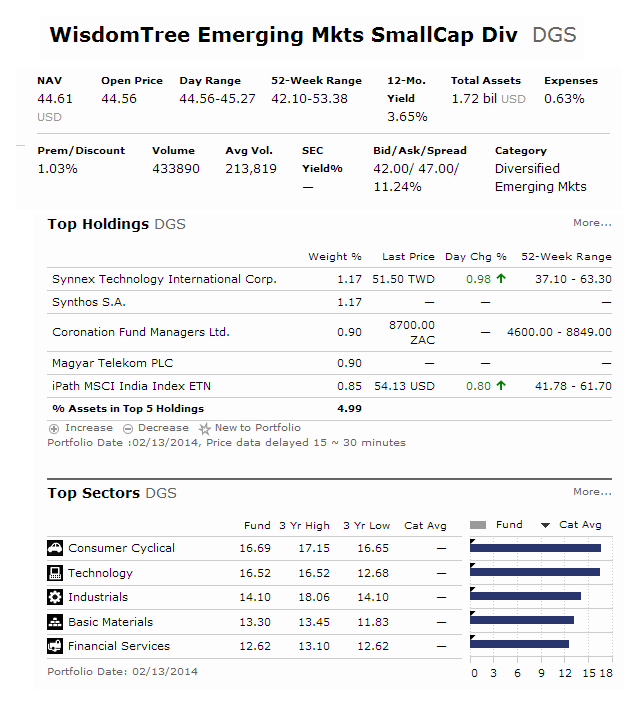 Find WisdomTree Emerging Markets SmallCap Dividend Fund (DGS) review. This ETF (Exchange Traded Fund) has a dividend yield of 3.65%. WisdomTree Investment is popular among investors as dividend stock ETFs provider. It also provides variety of exchange traded funds such as equity ETFs, currency ETFs, fixed income ETFs, and alternative ETFs. Some of the popular ETFs include WisdomTree Equity Income Fund, WisdomTree Total Dividend Fund, WisdomTree Emerging Markets Equity Income Fund, etc. Recently, you may find this DGS, The first emerging markets small cap ETF by WisdomTree ad in financial newspaper or magazine such as Barron. You would ask “Should I invest in this fund or not?” This is very typical first question for long term investor including retiree. Investing long term for your brokerage account or retirement account or 401(k) account needs deep review and analysis. Find the fund review below as well. Investing involves risk including possible loss of principal. Foreign investing risks include currency fluctuation or political/ economic uncertainty. Funds focusing on a single sector/ smaller companies generally experience greater price volatility. Emerging markets Funds are generally less liquid/ efficient and are subject to additional risks, including adverse governmental regulation, intervention and political developments. The Fund tracks an Index. Carefully consider the Fund’s investment objectives, risks, charges and expense before investing. A prospectus is available at wisdomtree.com. Read it carefully before investing. WisdomTree Funds are distributed by ALPS Distributors, Inc. The total net assets of this WisdomTree Emerging Markets SmallCap Dividend fund are $1.68 billion. This best ETF seeks investment results that correspond to the price and yield performance, before fees and expense, of the WisdomTree Emerging Markets SmallCap Dividend Index. The fund was first introduced to public in October 2007. It has annual expense ratio of 0.63%. The fund is currently traded at premium 0.41% from its NAV. It also has 12-month yield of 3.65%. The YTD return of this fund is -5.14%. It is rated with 4-stars rating by Morningstar. This top dividend stock fund has 5-year annualized return of 16.35% and 3-year annualized return of -2.31%. Last year, the fund has recorded a total return of -3.50%. The top 2 stocks in its holdings are Synnex Technology International (1.18%) and Synthos SA (1.18%). The top 3 sectors are Financials (20.32%), Industrials (16.44%) and Information Technology (15.55%). The top country allocation is Taiwan (28.66%) and South Korea (10.25%). This dividend stock ETF is great as an alternative low cost investment choice in emerging markets stock. It is ranked with high rating by Morningstar. High dividend is also great for income.